Moisture Barriers – Jones Pest Control Inc.
de-humidifier installation for Eastern North Carolina. It's important to control crawl space humidity here in Eastern North Carolina because unchecked dampness can lead to mold growth and dust mites under your home. Mold can damage and destroy many materials, while also causing serious health problems. Dust mites are microscopic insects that don't damage materials, but ingesting their feces and body parts can have harmful health effects. Dehumidify your crawl space for an allergen-free home. Most of us think the highest humidity spot is in our bathroom or kitchen. It could be. But how about your crawl space? Did you know that as much as 50% of the air in your home travels up from your crawl space? Air in crawl spaces always has a higher humidity level than the air in your home. If your crawl space is too humid, the air traveling up into your rooms may be infested with mold spores, dust mites, and immunity-compromising bacteria. 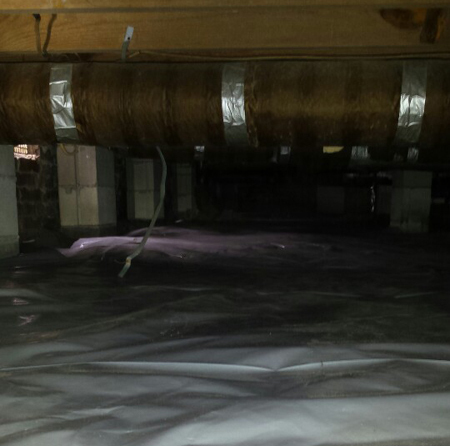 A crawl space dehumidifier keeps this vulnerable space healthy so your entire home reaps the benefits. Mold and mildew can grow when relative humidity levels go above 50%. By drying out basement and crawl space areas with a dehumidifier, you can create a drier environment with no mold and mildew. 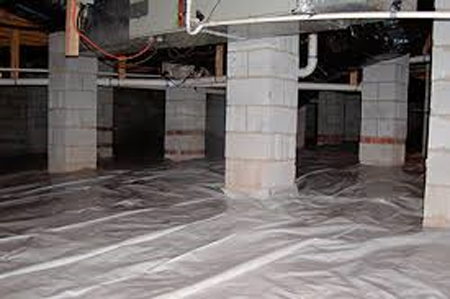 Bad smells come from mold and mildew, Getting rid of this will do away with the musty odors that come into your living space from your basement or crawl space. Mold reproduces by putting microscopic spores into the air. These airborne organisms trigger allergic reactions and respiratory ailments in many individuals. Effective dehumidification in basement and crawl space areas can put an end to this serious form of indoor air pollution. 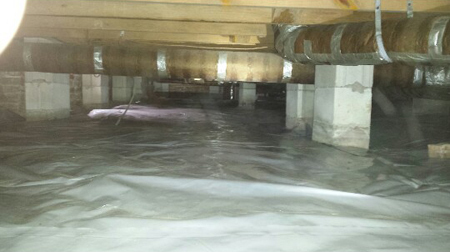 Closing a crawl space includes sealing the vents, installing a vapor barrier to cover 100 % of the soil, and installing a dehumidifier with a condensation pump.